’Tis the season… to be Productive? Christmas is a wonderful time of year, but it’s also one during which it becomes increasingly difficult to remain on-task. This is for a number of reasons, but principally because impending festive celebrations are generally far more exciting than work and with an entire year’s worth of hard graft behind you, fatigue quickly starts to set in. Despite this, I’m determined every year to be as productive as I can be once the decorations begin to appear and talk of turkey dinners fills social gatherings. I’ve done this myself many a time during the festive period. In the – slightly daft – belief that things will get a little quieter, client-wise, I’ve previously decided to fill my to-do list with as many tasks as possible that I’d previously been neglecting. In reality, all that did was completely stress me out. I’d simply overexert myself by promising far too much. Instead, we should all treat the festive period like any other when it comes to the to-do list. Only slot in those extracurricular tasks if you genuinely find yourself with time to spare. This time of the year offers the best opportunity to stop and take stock of your productivity methods. I, for one, have recently discovered bullet journaling, which has transformed the way I get stuff done. This same technique might not work for you, but if you find yourself at a loose end before Christmas, why not investigate different ways to keep yourself organised? It might result in the perfect kickstart to the new year! 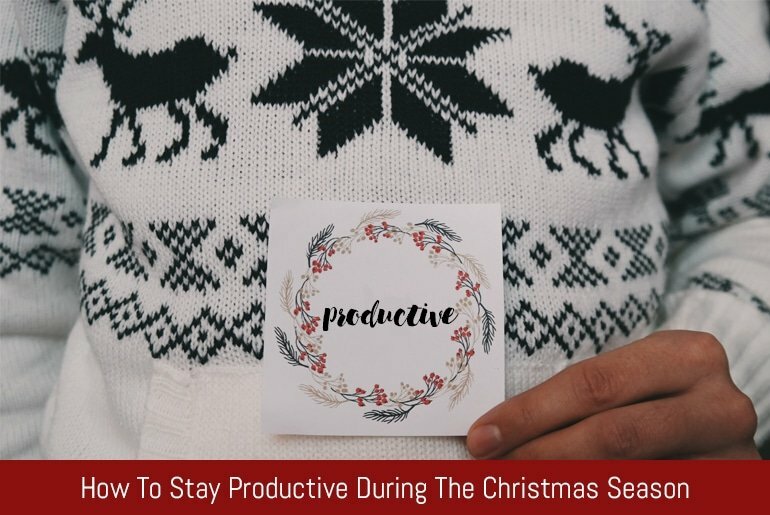 This is a common productivity technique, but particularly important during the run-up to Christmas. As noted, you’ll likely feel fatigued at this time of the year, which makes “me time” all the more important. Take a longer walk than usual, swap that evening of work for a night out with friends and stop working Saturday mornings for the duration of December. You’ll refresh your mind and body and your ability to get stuff done will increase as a result. If you’re relatively well organised and feel you’re normally on top of your to-do list, it can be scarily easy to let all that hard work go to waste at Christmas. With a new year looming, you might think “Ah, I’ll leave that job until January”. And, while that’s sometimes a completely legitimate thing to do, it can get a bit addictive. One job will become two, then three, and so on, and before you know it, you’ve filled January with a massive bunch of tasks that you’ll have no hope of completing on time. You’ll regret rescheduling stuff for the new year – trust me. If it can be done now – do it! Christmas party season presents some serious productivity challenges. One late night out with your team can result in a pretty rough morning the next day, and with so many parties to attend these days, you’ll probably need to adjust your schedule. Leave mornings as free as possible, or only schedule in the stuff that requires half your brain power. The bigger tasks will feel more manageable by the afternoon once you’ve had a few coffees and given your brain chance to recover. Being productive at Christmas is fun, but it requires a fair bit more effort than at other times of the year. My tips aren’t fool proof – nor are they exhaustive – but they will set you in good stead to both get stuff done and enjoy this wonderful time of the year.